International business leaders widely acknowledge that expanding a business to the United States will open significant new growth opportunities, technical advancements, and financial benefits. However, many business owners have found it difficult and expensive to set up and operate a US subsidiary. Obstacles typically include facing risks of heavy capital investment in the early development stages, lack of access to local US capital, and unfamiliarity with American business regulations and the local business environment. Sunshine State Enterprises LLC can address all those concerns and is positioned to assist our business partners in selected industries to establish operations in the United States. Now, however, a combination of economic forces is fast eroding China’s cost advantage as an export platform for the North American market. Meanwhile, the U.S., with an increasingly flexible workforce and a resilient corporate sector, is becoming more attractive as a place to manufacture many goods consumed on this continent. 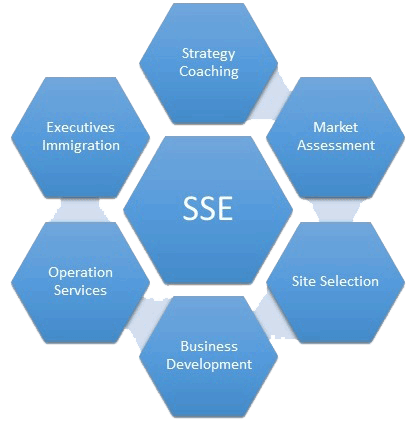 Your ONE-STOP Service Provider for ALL your business expansion needs.